HGW has given us a new selection of water slide wood grain decals. Some sheets come in generic panel sections others come in a layout that is designed for panels on specific scale WWI aircraft. It is these cookie cutter / fitted decals I will discuss. When designated by aircraft type the wood grain decal sections have specific positions and a location template is provided on the backside of the cellophane sleeve. The sections are generous in size and you must cut them to exactly fit a panel before you apply them. Note, the location template provided by HGW is not to scale Check the build images I provide. As I used these I started with the transparent set (#548016) on the Eduard 1:48 Alb. D.V/Va. This set has a clear base carrier for the pigments to ride on. I started with a semi-gloss almond or yellowed white base coat of paint on the kit fuselage. While the result is ok, I will go lighter with a decal grain in the future. 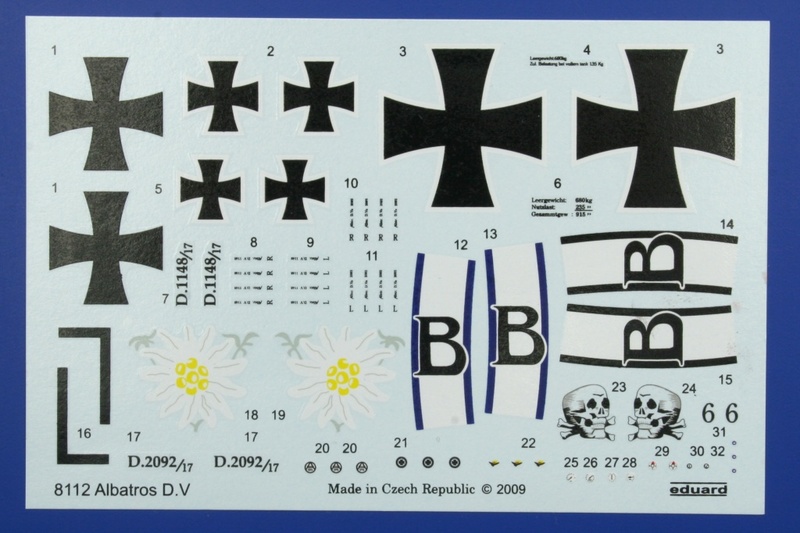 The white based decals (#548017) set has a lighter cast to it. The good thing is that I used panels from both of these sets on my fuselage to add some lighter and darker panels to accentuate the over-all appearance and as one master modeler said, “. . . lighter panel – gives the whole thing a bit more depth and interest. . .” Though I am thinking I would like to do a more blonde version of this decal set. One little known fact is that most plywood skins for aircraft were A/B grade Ash or Birch not Pine. So the lay of the grain could be fairly straight or pretty wild. This was called the "burl" of the grain. A was the outer face and the B or C grade was the inner face. A. One sheet of decal film with individual panels of wood grain. You must start by laying down two good coats of a “hobby” clear gloss on the new unused decals sheet. This goes for both the transparent and the white base sheets. Then after the second coat is dry to the touch and leaving no finger prints begin cutting paper templates on the model of the areas you want to work on first. Note! Do not use a general use clear gloss as it might be too “hot” for the decal sheet and ruin your project before you get started. Also the surrounding areas of the decal in black are excellent test areas to see if your sheet is dry to the touch. I use Testors “Glosscote” and “Dullcote” rattle can sprays. I have not seen them ever yellow with age. Then transfer the paper pattern to the decal on the sheet and cut the panel out with a "sharp" blade. The curve on the spine area needs to be accounted for by the modeler. Apply the cut sections over the existing painted panels. Know that the transparent sets need to be used with caution. Use liberal amounts of setting solution as these will stick fast if you do not have some fluid to slide them into place. Note; The empty decal paper backings can serve as templates for any future projects in the same scale. When they are completely dry just mark them by number or location as to their placement positions. 1@ Albatros D.V/Va fuselage, factory finish wood grain paneling only. Highs: Excellent adherance properties. Pleasing results. Some generous sized panel sections so minor variations can occur. Not bad for an over all effect. Working on this build there are several areas the HGW cookie cutter decals don't reach or cover. Specifically its the lower wing roots. Now I will be able to fit them as I purchased two sheets, But consider that you may need to pick up their generic sheets that are simply block of wood grain decal. While I am using an early Eduard series 80xx kit fuselage & wings I chose decals set from their new #8112 kit to do Walter Böning's machine D.2092/17. In the past Eduard and Propag decals have done this machine in Red, black and blue bandings. Due to the fact that he commanded Jasta 76b it was probably dark or cobalt blue. "By the time that Walter Böning became the first CO of Jasta 76b, he had already six victories to his credit, achieved while attached to Jasta 19. With the new unit, he gained a further eleven kills over British and French aircraft. He gained the last two on May 30th, 1918, but the following day would prove fateful. On initiating combat with Camels from No.70 Squadron, RAF, he suffered a minor collision with a colleague, Vzfw (acting sergeant). George Markert. Both were able to recover, but having lost focus, were immediately attacked. Markert went down in flames, while Böning was able to land at his own airfield, but did went to the hospital." Ltn.d.R. Walter Böning is WIA in the lower left leg at 18.15 hours over Fricourt in Albatros D.Va 5765/17 and to hospital. As can be seen he was not wounded in this machine. The Eduard wing camouflage colouring is not accurate for D.2092/17 . The transition from the Alb. D.V 1st batch to the second saw the introduction of the Lilac (not mauve) colour for Johannistahl built machines. These usually employed either dk green & lt. grn or a brighter verion of the lt. grn and the violet / lilac. Here the wing roots have been covered. Fitting the prop and a bit of touch up and she's done. My last for 2011.